Degen's Piano, Inc. provides top-notch the best service for your piano maintenance along with great customer support - a combination that can't be beat! After three generations of piano tuners and rebuilders, we are backed up with over 60 years of experience on the piano industry. Through our commitment, experience, and expertise Degen's Piano, Inc. has established a business relationship with our customers that will last a lifetime! It all started in 1910 when George Degen opened "The Degen Music Store", in the "Calea Victoriei" (Victory Street) of Bucarest, Romania, which later on started to build pianos and other musical instruments. By 1937 George's son, Alfred Degen, begun helping him in the management of the store, learning the secrets of the maintenance of pianos, which he perfected through practice and study long after he and his family left Romania due to the effects of the World War, moving to what later would become the State of Israel. There, Alfred carried on with the family trade, which he would later pass on to his son, Elian, who was born in Haifa in 1952. In 1958, the Degen Family left Israel and went to Venezuela. Upon his arrival, Alfred started working for the best Piano Shops as Musica y Arte, Musikalia, Almacen Americano and many others, until beginning of the 1960´s when he established his own shop, and was appointed to care for the instruments of places like The National Theater, The Municipal Theater, The Caracas Athenaeum and the best Venezuelan and International Orchestras performing in the Country. 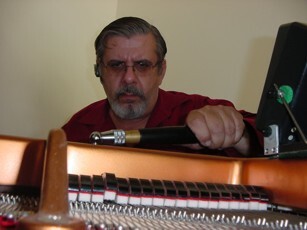 Elian Degen, his son, not only inherited the profession from him, but also continued piano tuning and repair studies at the London College of Furniture; coming back to Venezuela in the beginning of 1970´s to follow up his father´s work with the same success. In 1983 in Caracas opens up what is considered as one of the most modern Theaters in Latinamerica: The "Complejo Cultural Teresa Carreño". For this opening, Venezuela invited many of the most famous Orchestras and performers around the world and Elian Degen was appointed to service and care for the pianos during this event, which is still considered by him as the most outstanding part of his carrer. New York Philharmonic Orchestra, Zurich Chamber Orchestra, Hamburg's Orchestra, Saint Paul Chamber Orchestra, Paris Opera, The London Festival Ballet, Israel Philharmonic Orchestra, Vienna Orchestra, The Preservation Jazz Band, Les Luthiers, Yehudi and Jeremy Menuhim..
From then on, Elian Degen has not only been perfecting his skills, but also have been improving the range of services offered to his customers, which include Advise, Polishing, Sales and Rebuilding. Since 2003, we begun business in the United States, where our costumers receive the same quality service and advice that has always defined Degen's Pianos. Call Degen's Piano, Inc. at (954) 614-3453 today!